The contact thermometer PCE-T390 is a digital device with four input channels for type K and type J temperature sensors and two input channels of the type Pt100 temperature sensor. The contact thermometer PCE-T390 has an internal memory in form of an SD card (from 1 to 16 GB). 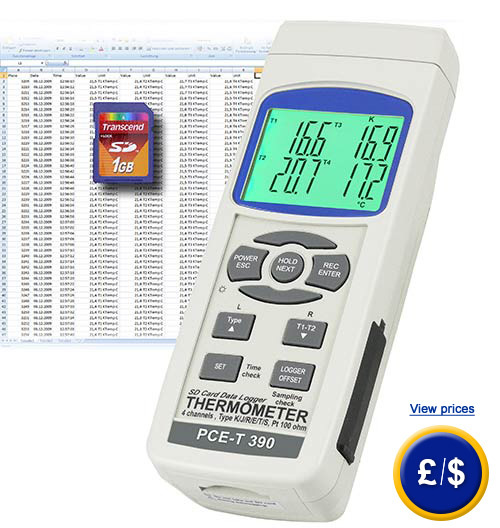 Data is registered in the memory card (xls format) of the contact thermometer PCE-T390 - therefore no additional software is required for further analysis. 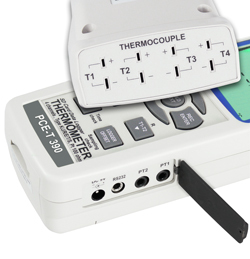 The optional software of the contact thermometer PCE-T390, which comes included with a RS-232 cable, allows the user to store values so that this data can be transferred to a computer for further analysis. Time intervals can be programmed, whereby the contact thermometer can function as a data logger, ensuring that all readings get stored over an extended period of time. The contact thermometer PCE-T390 can be used to measure online or as data logger. The display of the contact thermometer PCE-T390 shows the temperature of all four channels simultaneously (when they are connected to the corresponding sensors). The contact thermometer PCE-T390 can be used as a handheld device in situ or as a data logger for monitoring temperature fluctuations over a period of time. The contact thermometer PCE-T390 can be used in an almost unlimited capacity in maintenance, conservation, machine diagnostics and quality control. The contact thermometer PCE-T390 can also be used for measuring in real time or as a data logger. 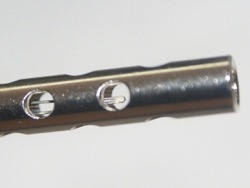 Type-K, J and PT100 temperature sensors can be connected to the contact thermometer PCE-T390 . Here you will find a selection of type-K temperature sensors. The contact thermometer PCE-T390 can be DIN ISO calibrated, including a corresponding control certificate. At the following link you will find another type of contact thermometer. Here you will find another contact thermometer with two channels, memory, RS-232 interface and software. The contact thermometer shuts off after 30 minutes of inactivity. This function can be disabled. 0 ... +50 °C, <85 % H.r. This thermometer has an SD card to record measured values. 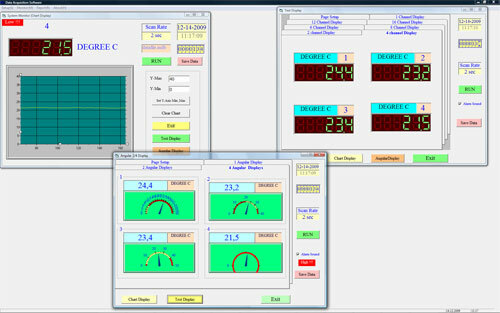 Pressing the "Set" adjusts several parameters, among others the measurement share. After setting the parameter, you can start recording data. To do this, press the "REC / Enter." On screen, you get the symbol "REC." Then press the "Logger". At that time, the data begins to be recorded on the SD card. In order to record the data, again press the key "Logger". If you then press the "REC / Enter" key for two seconds, the recording function is finished (the symbol "REC" disappears on the screen). Here you will find another contact thermometer with one data channel memory, RS-232 interface and software. Examples of use of the contact thermometer PCE-T390. 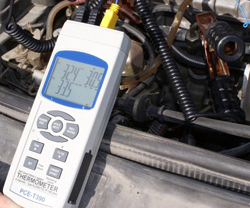 Thermometer in the field of measuring the temperature in a vehicle with different models of K type probes and crocodile probes. PCE-T 390 Multichannel contact thermometer with data logger for temperature control. 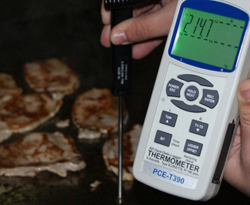 Temperature verification of a kitchen grill using the contact thermometer PCE-T 390. Temperature measurement of a car engine with the thermometer and a rod probe. A thermometer is an instrument used to measure the temperature of people or things . The mercury thermometer is the most used and known thermometer used to measure the temperature of people. It consists of a graduated sealed glass capillary tube marked in degrees and a vial of mercury in one end. But there are many other types of thermometers, such as the digital thermometer that we present for contact temperature measurements in any sector of industry, and even the infrared thermometer for non-contact measurements. Temperature is the physical property that refers to hot or coldness, but the meaning in thermodynamics is more complicated, because the heat or cold we perceive is more related to the thermal sensation than to the actual temperature. 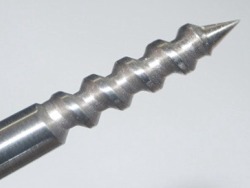 This type of thermometer can use a steel temperature probe as shown in the image above. We have another type of thermometer to use with food with which you can measure temperature with or without contact, i.e. it can measure temperature with a steel probe that is built into the thermometer or by a laser beam (PCE-IR100). Therefore you can take measurements of temperature without any problems using this type of thermometer. This type of thermometer has been especially created for food. It combines the method of non-contact measurement of food with the method of internal temperature measurement through contact, using the folding penetration sensor penetration. This thermometer has an IP 65 protection class, which allows hygienic cleaning (rinsable case). This thermometer has a measuring range from -40 º to +200 º C when the measurement is made by contact and what it measures is the core of the object. The no-contact thermometer a measuring range from -40 º to +280 º C on the surface of the object. This type of thermometer complies with HACCP. -Balloon thermometer, which is used to measure the radiant temperature. It consists of a mercury thermometer that has its bulb inside a hollow metal sphere which is black painted. What the sphere does is to absorb the radiation of the objects which are warmer than the surrounding air, thus producing a radiation to cooler objects and resulting in a measurement that takes into account the radiation (it is used primarily for testing the comfort conditions of people). -Wet bulb thermometer, which is used to measure how humidity influences the thermal sensation. -Maximum thermometer and minimum thermometer, which are used in meteorology to detect the highest and the lowest temperature of the day. The maximum thermometer is a mercury thermometer whose capillary becomes narrower near the bulb, while the minimum thermometer is composed of an organic liquid (alcohol) and has a glass colored index submerged in the liquid. This model of thermometer can display the measurements in Celsius or Fahrenheit. Temperature is a physical quantity that expresses the degree or level of heating or cooling of the body or the environment. In the international system of units, the temperature unit is the Kelvin. Then, more generally, we will talk of other units of measurement for temperature. First we can distinguish two categories of the measurement units for temperature: absolute temperature and relative temperature. -Absolute temperatures are the ones which start from absolute zero, that is the lowest theoretically possible temperature. It is the point at which the molecules and atoms of a system have the lowest thermal energy possible. The Kelvin International System is represented by the letter K and has no grade symbol "º". It was created by William Thomson, on the basis of degrees Celsius, thus setting the zero point at absolute zero (-273.15 º C) and keeping the same scale for grades. The Kelvin system was established in the International System of Units in 1954. -Relative temperature, whose name is derived from the fact that they are compared to an established physical-chemical process that is always produced at the same temperature. Degree Celsius (International System of Units) or also called degree Celsius, are represented by the symbol º C. This unit of measure is defined by setting the freezing point of water at 0 degrees and the boiling point of water at 100 °, both measurements at one atmosphere of pressure, and dividing the scale into 100 equal parts each of which corresponds to 1 degree . This scale was proposed in 1742 by Anders Celsius, a Swedish physicist and astronomer. Degree Fahrenheit (International System). This takes the divisions between the freezing point and the evaporation point of ammonium chloride solutions. Therefore, the proposal of Gabriel Fahrenheit from 1724 is based on the freezing temperature (0 °) and in the evaporation temperature (100 °) of ammonium chloride in water. Fahrenheit used a mercury thermometer in which he introduced a mixture of crushed ice and ammonium chloride in equal parts. The concentrated salt solution was the lowest temperature possible in the laboratory at the time. Then he performed another mixture of crushed ice and pure water, which determines the point 30 º F, and later at 32 º F (point at which ice melts). Later he exposed the thermometer to the steam of boiling water and got the point 212 º F (point of water boiling). The difference between the two points is 180 º F, which divided into 180 equal parts determines the degree Fahrenheit. In addition, the thermometer can measure both Celsius and Fahrenheit. * Use "." for ","
PCE-T 390 contact thermometer can be configured via the keypad or by using the software. Data and time are stored in the SD memory card as a xls table. Data can be show graphically or in spreadsheet format on the contact thermometer or via the software. Thanks to the analysis in xls format it is possible to show values graphically with the four channels without any additional software. With the RS-232 cable for the contact thermometer PCE-T390, optional software values can be registered for further analysis. 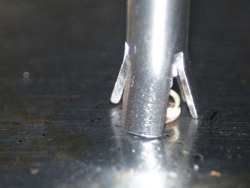 Measurements done by the PCE-T390 Digital Thermometer with a TF-101 temperature contact probe to measure the surface temperature of a kitchen grill. The PCE-T390 Digital Thermometer can also use type TF-119 temperature probes for meat and frozen products. Type TF-108 room temperature sensor that can be also used with PCE-T390 Thermometer. 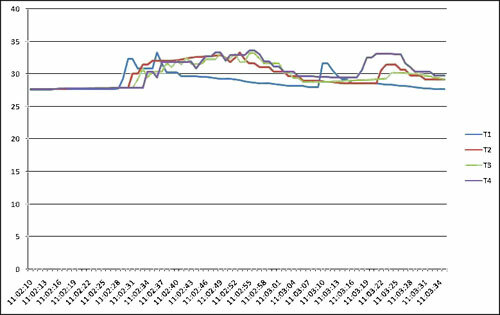 1 x PCE-T390 contact temperature, 2 x type-K temperature sensors, 6 x batteries, 1 x SD memory card, user's manual. For companies that wish to incorporate the contact thermometer PCE-T390 into their internal quality control system of tools or for annual calibrations. The certification meets ISO standards and includes a laboratory calibration and a certificate which contains the measurement values. It also indicates the company name and address or the person who ordered the device. 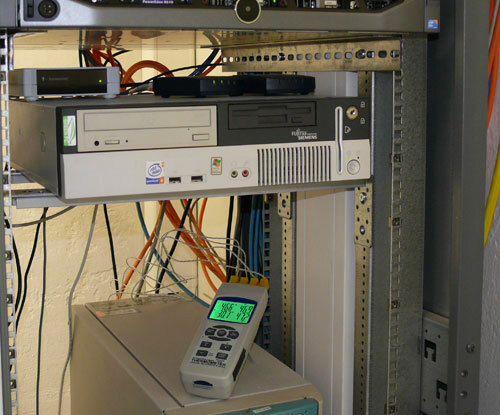 The software is used to transfer data from the PCE-T390 contact thermometer to a computer or laptop. 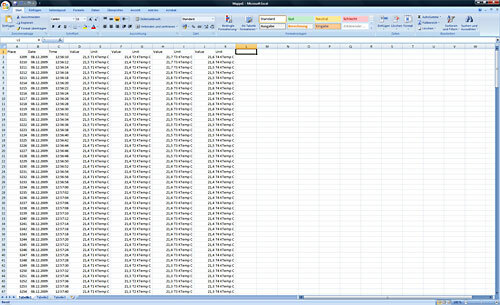 These measured values can also be transferred to other calculation programs such as MS Excel. A connection cable is included in the delivery. We offer different type-K temperature sensors for the PCE-T390 thermometer. Mains adapter for the PCE-T 390 contact thermometer (230V/50Hz). To measure temperature over a extended period of time. Contact us and our technical staff will advise you on the temperature sensor that best suits your needs. Calibration: Control of the accuracy in the measurement magnitudes of the contact thermometer without the intervention of the measurement system. Calibration also refers to the determination of the systematic deviation of the contact thermometer display in relation to the real value of the measured magnitude. Calibration document or certificate: Document with the technical properties of the contact thermometer according to the national organization of measurement. This means that the user is responsible for checking and controlling the interval between calibrations. We recommend that this calibration interval should be between 1 and 3 years. We also offer the user our expert advice to resolve any questionss related to the process of establishing calibration intervals or any other technical questions. The accuracy of the calibration depends on the contact thermometer and the sensor combined. In the case of the PCE-DM 22 contact thermometer, this means that the calibration should be done for up to four temperature sensors.